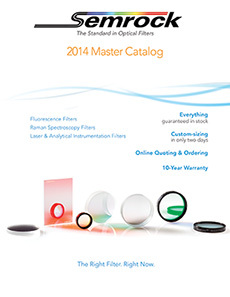 Rochester, NY – Semrock, Inc. announces the release of its new 2014 Master Catalog. This edition provides a more concise layout of product information to streamline product selection, and features new products including assorted single-band bandpass, edge filters and dichroics. The offering also includes a BrightLine® full multiband laser filter set optimized for 405, 488, 532, and 635 nm, and new standard sizes for many of the products. The standard product offering now features the Brightline 11-band filter optimized for imaging formaldehyde. This filer has extremely high transmission, steep and well-defined edges, and outstanding blocking between the passbands. For CARS applications Semrock’s StopLine® Notch Dichroic beamsplitters at 405 nm, 488 nm, and 632.8 nm are also new to this volume. Each beamsplitter reflects a standard laser line incident at 45° while efficiently passing the shorter & longer wavelengths. Optimized for ~40 - 120 fs Ti:Sapphire lasers, the PulseLine™ Femtosecond Dual-Band Mirrors are now available at 400/800 nm. Also new in this edition are the 810 nm and 1030 nm MaxLine® laser clean-up filters, and an expanded range of RazorEdge® E-Grade LWP filters at 363.8 nm. Exceptional Semrock service includes same-day shipment, two-day custom-sizing, and a 30-day, no-hassle return policy. All Semrock filters also include a ten-year warranty. Request your free print or PDF copy of the catalog directly from the website today.